Note by the author: I cannot take credit for most of the ideas and observations I present below. The protests in Hong Kong are now in their eighth day. Since they began last week a great amount has been written about why these protests are happening and what their eventual outcome may be. It has been disappointing to see astute voices and analysis drowned out by fairly insipid primers and listicles. This post aims to remedy the situation by blending the best insights from the best China hands into one essay. If you would like to explore the material that inspired this post (or follow this story more closely in the future), I invite you to consult the “Further Reading” section at the bottom. At the time of this writing Hong Kong has returned to a semblance of normalcy. The protests may flare up again before the week is over, but we can take advantage of the present lull to assess what has been accomplished thus far and what hope the movement has of compelling the government to meet its demands in the future. The last eight days have been an emotional affair. Most of the discussions I have had about the protests have also been emotional affairs—especially when someone from the mainland or from Hong Kong is participating. This post is different. I am not interested in arguing about which side is right or wrong but in assessing the probability of either side forcing the other to cede to its demands. Lets start with the protestors. What are the protestor’s demands? Hong Kong chief executive Leung Chun-ying (hereafter CY Leung) will step down. Hong Kong will institute a democratic system where candidates for popular election are chosen by voters, not a committee selected by the Communist Party of China. The original body of protestors who demanded these things were organized by two groups, the Hong Kong Federation of Students (香港專上學生聯會, abbrv. 香港學聯, or just 學聯), composed of Hong Kong university students, and Scholarism (學民思潮), headed by 17 year old Joshua Wong and mostly composed of youth about his age. The famous photos of umbrella clad youth being pepper sprayed as they charged government lines were of these folks. They were joined by a third group, known as Occupy Central with Peace and Love, or Occupy Central for short (讓愛與和平佔領中環, abr.佔中), on the second day of the protest. Occupy is a different sort of beast than the other two organizations; it is run by seasoned political activists and university professors who have been planning a civil disobedience campaign to protest the 2017 election reforms since early 2013. They had planned to start the protest on October 1st (the PRC’s National Day, the closest equivalent China has to the 4th of July), but when the clashes between students and police escalated on Friday (Sept 26th) they decided to abandon their original plan and join the protestors. Had they been in charge of the show from the beginning I am not sure they would have made the same demands—at least in the beginning—that the students did. But they came late to the party and have to deal with what the students' demands hath wrought. “Tiananmen 1989 was a remonstrance/petitioning movement that eschewed disobedience beyond passive resistance and had no political endgame beyond hopes that the regime would respond to its moral suasion by implementing democratic reforms. If there were political calculations to utilize the demonstrations to advance a concrete agenda, they came from reformers inside the elite. This is an important point to remember. These protests are not a spontaneous eruption. The leaders of Occupy have contingency planned and red teamed these protests for a year. While it is quite possible for events to spiral out of their control, our baseline assumption should be that the movement is following a strategy and they have a game plan for a wide range of government responses. 2. Opinions polls from before the protest began suggest that only a bare majority of Hong Kong’s population support Occupy. There is a substantial portion of Hong Kong—mostly an older portion—that truly despises all of this ruckus and wants nothing to do with it. Popular feeling is in the students favor only because the government was dumb enough to try and stop the first wave of protests with pepper spray and the second wave with tear gas. Had the government not made this mistake, there would be far less outrage among the populace and the protests we saw this week would be much smaller and far less newsworthy. Approval ratings for the Occupy Central, Beijing's electoral reform plan, and so forth. Click for larger image. Sample sizes and details about the methodology of the survey can be found here. 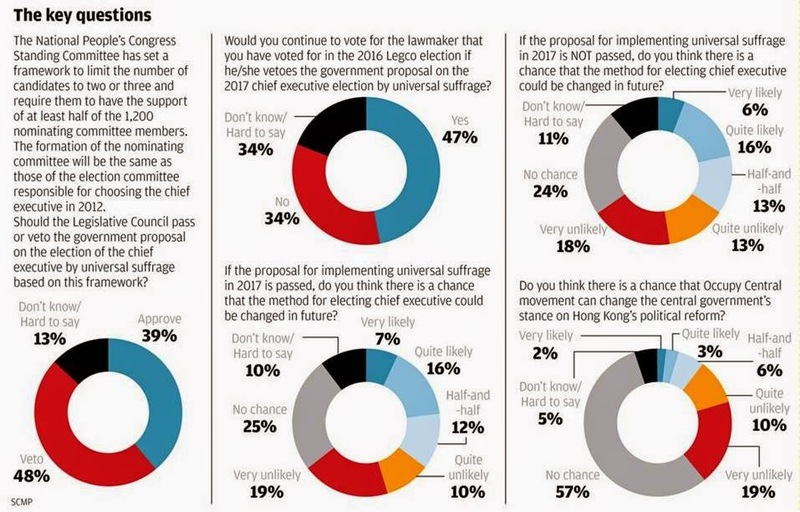 The graphic was created for South China Morning Post article, "Half of Hong Kongers Say Government Should Veto Beijing's Electoral Reform Plan" (15 September 2014). What have the protestors done to compel the government to meet their demands? The short answer: they have flooded the streets with Hong Kong citizens and paralyzed many essential areas of the city for six days. What have the results of this been? In many ways, nothing. CY Leung is still in power. Popular democracy is no more likely to be implemented than it was before the protests began. The protestors are in a very difficult position. It is hard to force other people to do things they don't want to do. Usually you have to inflict great pain—or threaten to inflict even greater pain—to compel anyone to do anything. Shutting down a few streets and neighborhoods does not inflict enough pain on CY Leung or the government to force change. If the protestors want to succeed they must escalate. That’s the rub. The most obvious answer is "violence." But violence won't work—remember, the protestors only gained strong popular support after they became 'innocent' victims of the government's violence. They lose their support—and with it their ability to pull off big protests—the minute they are seen as a violent movement. Moreover, if they became violent and destructive the government has full license to act violent and destructive back. This is a game of tic-for-tac Beijing would not mind playing. Hong Kong is an island dependent on the mainland for its food, water, and electricity. Its citizens do not own guns. If either side decides to communicate through “the diplomacy of violence” the government wins. Thus the easiest way to escalate affairs is broaden the scale or the scope of the protests--for example, by shutting more of the city down or denying the government (or their tycoon supporters) access to its more important parts. If they successfully pull this off, what will happen? Nothing. This an essential point. The citizens of Hong Kong could make CY Leung’s life a living hell, they could freeze the entire city and throw all of Hong Kong into chaos, and this still would not be enough. Why? Because the decisions that matter are being made by the government in Beijing, not the government in Hong Kong. The people of Hong Kong have the power to inflict significant pain on CY Leung and even more damage to Hong Kong’s economy. They do not have the power to do anything to the CPC leadership sitting warm and snug in Zhongnanhai. This is the trouble with editorials like Chris Patten's latest, which says that communist leaders will regret ruining "their country's most successful city." Back when Mr. Patten turned Hong Kong over to the People’s Republic that statement would have been self-evidently true. Now it isn’t. In those days Hong Kong was 16% of China’s total GDP. Now it is a bit less than 3%. Hell, given the growth we have seen in Guangzhou and Shenzhen over the last two decades, it isn't clear that Hong Kong is the Pearl River Delta's most successful city. The cold, hard facts of the matter is that China’s economy grows by two Hong Kongs a year. The region's economy is not important enough to Beijing for the protestors to use it as a bargaining chip. 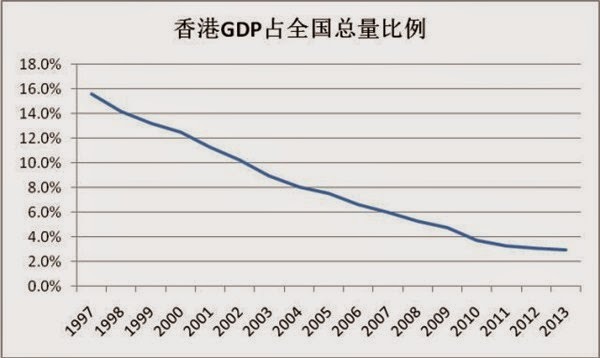 Hong Kong's GDP as a percentage of China's national GDP, 1997-2013. From: 施济津，王笑哲，郁夕之 [Shi Jijin, Wang Xiaozhe, and Yu Xizhi], “智谷趋势：待到2017普选，香港已成“二线城市”？[“Trigger Trend: By the 2017 elections, will Hong Kong already be a Tier-2 City?,],” 观察者 [The Observer] （28 September 2014）. This is the crucial weakness with the protestor’s place at the bargaining table: they have nothing to bargain with. The movement's only real hope is that those who do have bargaining power—say, the United States or Europe —will become so concerned with the situation that they start putting pressure on Beijing to compromise with the protestors. In the end this is the essence of the Occupy strategy: cause such a ruckus that international community gets involved and all of Hong Kong has to choose between supporting them or Beijing. Afterwords, accept whatever face-saving concessions the government offers them. Let’s shift gears now and look at the other side of the equation. What are the government’s demands? They want the protests to stop. I have suggested that the government does not attach much value to Hong Kong’s economy, so it is important to understand why the government cares about the city’s protests in the first place. The government in question is not CY Leung’s administration, which has an obvious stake in the conflict’s outcome, but the upper echelon of the Communist Party of China, especially the General Secretary of the Party and President of the People's Republic, Xi Jinping. Many have suggested that the Party fears pro-democracy protests could spread to the rest of China if this succeeds or lasts too long. There is precious little evidence for this view. On the one hand, news of what is happening in Hong Kong is heavily censored and most mainland Chinese have only a fuzzy idea of what is happening there. They have not been seeing the pictures you have been seeing. More importantly, very few of the mainlanders who do know about the protests support them. David Wertime had an excellent piece up at Foreign Policy on the way mainland Chinese “netizens” have been framing the protests that discusses this point at some length. As he reports it, folks on the mainland have reacted to the protests with cynicism, anger or disgust; they characterize the Hong Kongers involved in the protests as spoiled, snotty, unpatriotic, or treasonous. What Wertime describes is exactly what I have seen in my own social network—including most of the Chinese nationals I know living in America who have seen the exact same news reports and photographs you and I have. Most mainlanders look at the demonstrations and see anti-China, not pro-democracy, protests. The protestors' problem here is that a fair deal of their rhetoric is anti-China. Many (perhaps most) of the Hong Kong kids out there protesting think mainlanders are uncouth barbarians locusts whose pooping children and appetite for real estate have ruined the city. Out of the dozens of young Hong Kongers I have met, only one has ever introduced herself to me as Chinese. The most recent numbers from HKU's Public Opinion Program paint a similar picture: only one in five Hong Kongers identify first and foremost as Chinese nationals. This cultural split provides a lot of emotional fuel behind these protests. It should not be surprising that mainlanders—treated with the same sort of disdain liberal urbanites in San Francisco reserve for rednecks from Kentucky—are disinclined to view protests against their government charitably. As long as the protests carry this anti-China flavor the Party has no need to worry about them spreading to the rest of China. Xi Jinping’s stake in the movement’s outcome is more personal. To understand why we must step back and look at the broader set of challenges facing the CPC's leadership. Their great test is the liberalization of the Chinese economy. They know as well as any Western economist that China’s economic growth will fall to pieces if real economic reform does not come soon. The window for reform is short—if it does not come in the next year or so China will see its own Japanese-style “lost decade.” There really is no other way out. But reform is hard. To reform China’s broken financial and SOE system is to slaughter the cash cows of many powerful men. Liberalization cannot succeed unless the Party finds a way to shift the distribution of power within the country so that those who opposed liberalization can be silenced and the reforms can be forced through. This is where Xi Jinping comes in. There you have it. Xi Jinping is the guy who has committed to be “man enough” to face down any challenge to the Party’s rule. The creditability of his entire project relies on his ability to maintain his reputation of a tough authoritarian. He cannot let any set of Chinese protestors “win” without suffering severe audience costs. He has skin in the game. How can the government compel the protestors to meet its demands? The Communist Party of China has two options. Option one is force and violence. This will work, especially if it is truly violent. Events havee shown that limited violence just make the protestors stronger. Real bloodshed, on the other hand, will end things. Option two is…wait. Think of it this way: the protestors have to eat. They have to pay their rent. Many have to feed their families. They are blocking off the businesses of many other people who also need to do these things. Given all of this, how long can they continue their occupation? Only as long as it takes for the protestors to get tired, worn out, hungry, and hot. If nothing seems to be happening for long enough then the momentum will be lost and the main mass of protestors will slowly melt away. Now you can see the contours of the conflict ahead. The government will do everything it can to keep tensions low—they will try and wait this out. The protestors, on the other hand, are going to do everything in their power to get the government to over react. They want to be bludgeoned and pepper sprayed. Repression like this polarizes the Hong Kong people, bolstering Occupy's support among their fellow Hong Kongers, and it seizes the international spotlight. The protestors are quite aware that in the eyes of a Western liberal nothing sanctifies a movement quicker than a baptism of pepper spray and tear gas. Over the past eight days we have already seen this dynamic at work. Earlier in the week the protestors leveled an ultimatum demanding CY Leung resign or they would lead students to storm and occupy government buildings. Earlier this year the Sunflower Student Movement proved that this is an extremely effective way to prolong and escalate a stand-off. Had the students in Hong Kong managed to pull off what the students in Taiwan did last spring it would be a big deal. They did not pull it off. The government managed to deflect the threat by proposing "talks" with the protestors. The talks never panned out--but the ultimatum was not renewed. Now, as the Golden Week holiday ends and businesses and schools reopen, the government is trying once again to open talks with the protestors. It is an effective stalling tactic ideal for sapping the protestors' stamina. At the time of this writing, most of the protest sites are manned by a few hundred protestors a piece. I don't expect this lull to last. To succeed the protestors must play a perverse kind of game. They have a strong incentive to do everything they can to push the government to just under the point where real military power is used against them. They will try to poke the dragon without provoking its flames. It is hard to point readers to specific sources for many of the ideas presented here because a great deal of it comes from Twitter. Thousands of tweets have been fired off over the last week and I regret to say that I have not saved the most important ones. Most of my thoughts on the matter developed as I read and tweeted with the folks listed below. The South China Morning Post is the best source in English for clear updates on the situation on the ground. It has has an active "live updates" page and posts a summary of all the day/night's major events every 12 hours. This live video stream is superior. It includes simultaneous live coverage from NOW, Apple Daily, and another local channel. It appears to be deactivated until things get hot again. The best people on twitter for a steady stream of updates from the field tend to be reporters and free lancers working there. Alan Wong (@byAlanWong), Carmen Ng (@Carmen_KaMan), and Joanna Chiu (@joannachiu) are all solid picks. For broader analysis of Chinese politics as a whole I recommend a few names from my blog-roll: Bill Bishop (who runs The Sinocism Newsletter and tweets at @niubi), Jamie Kenny (blogs at Blood and Treasure and tweets with @jkbloodtreasure), and Peter Lee (blogs at China Matters, writes articles for Asia Times Online, and tweets at @chinahand). If Adam Cathcart, Ananth Krishnan, Eric Hundman, Gady Epstein, or Jeremy Goldkorn had blogs I would read them. The last fellow has a pod-cast however, and the backgrounder they did on Hong Kong's growing protest movement a few months ago may be useful. Conservative readers may notice that the China-watching community leans left. You'll just have to deal with that. Finally, Facebook or Wechat chat threads, e-mails, and face-to-face conversations with friends from or in Hong Kong and the mainland have also shaped my views of the situation. I thank all of my Chinese friends for being willing to talk to me about such an emotional and uncomfortable issue. Peter Lee, “Beijing Reaps Bitter Fruits in Hong Kong,” Asian Times Online (29 September 2014). Hong Kong has never had universal suffrage, but freedom of association is a liberty Hong Kongers have long enjoyed. I submit that most Hong Kongers are far more alarmed with the erosion of this liberty than they are with the election laws--after all, most of them never expected popular suffrage anyway. This might explain why the reaction to HKPD's tactics was so explosive. The phrase comes from Thomas Schelling, Arms and Influence (New Haven: Yale University Press, 1996), p. 1. Yes, I am not using it quite as he intended. Chris Patten, "The Hong Kong Government Must Listen to its People," South China Morning Post (28 September 2014). See University of Hong Kong POP, "HKU POP releases latest survey on Hong Kong people’s ethnic identity" (17 June 2014). Their breakdown of the strength of Chinese identity by age is also worth looking at. My views on this question closely follow those of Michael Pettis, who explained the important details in depth in a brilliant essay last month:. "What Does a "Good" Adjustment Look Like? China's Financial Markets (1 September 2014). Willy Lam, "No. 1 is Key: Xi Jinping on the Art of Leadership," Jamestown Foundation: The China Brief, vol 14, iss 15 (13 July 2014). In Chinese that is "不是看見希望才行動，而是行動才會看見希望"
For the original source, see "港學運領袖周永康：勿寄望溫柔換來變革," 自由时报 (29 September 2014).